The IITA Cassava Weed Management Project (IITA-CWMP) has developed a mobile application that helps farmers to apply the correct dose of herbicides on cassava and other field crops. In most rural communities in Africa, the use of knapsack sprayers is common, and the challenge has been the difficulty of farmers knowing exactly what quantity of herbicides to add to their knapsack to avoid over- or underdosing. 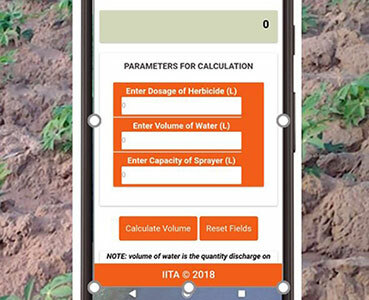 IITA Director of the Development and Delivery Office and Project Leader of IITA-CWMP, Alfred Dixon, said the development of the first version of the app was a welcome development to help farmers to efficiently apply herbicides and control weeds. “Besides, the beauty of this app is that it helps farmers to calibrate themselves and can also be used in other crops,” he added. Godwin Atser, Communication & Knowledge Exchange Expert at IITA, who led the development of the mobile app, said the app can help millions of farmers in Africa on how they make decisions about the application of herbicides. “In several communities where I have trained farmers, the challenge has been how to get farmers to calibrate properly themselves, and more importantly what quantity to mix in the spray tanks. This app provides the solution,” he added. Further validation and a launch of the app is being planned.